Let short Subtotal: no economy, no aesthetics, no random factors do not explain the transition Yuri Dolgoruky in the middle of the XII century white-stone building. Functional sense, as we saw in paragraph 9 main 1, in white stone was not there: brick churches across Russia were their increased size and the great Prince of Vladimir "bypassed" even a modest Ryazan. Therefore, to answer the question why in Suzdal began construction of white stone, we must continue our historical and motivational modeling era. But first of all it is necessary to consider the version, followed by N.N. Voronin78 and PA Rappoport79- invitation Yuri Dolgoruky cooperative masters of Galich. This version can be summarized as follows: in 1152 by Yuri Dolgoruky came Guild masters, previously constructed in the Galician land, whose Prince vladimirka Volodarevich Dolgoruky was an ally in the fight against Izyaslav Mstislavich. Yuri their collectives had, since the last churches in Suzdal was built in Monomakh, and took Galicia team together with the technology of building of white stone used in Galich80. Now this view is shared by M. ioannisyan, specifying that the arrival of Galician artists took place in the late forties XII century81. In support of the Galician version, which could be described as dominant in the modern history of the Vladimir-Suzdal architecture, there are many arguments, their most of which is shown in studies M. ioannisyan. 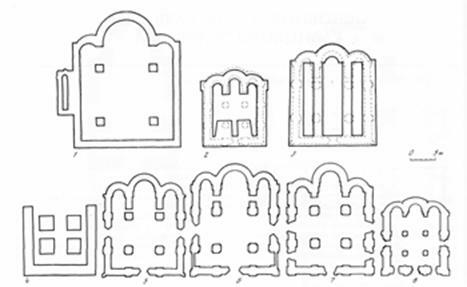 For brevity, only here they are: the similarity of building materials, masonry walls and vaults of detail of the plan, foundations and sculptural decoration82. "For," says even such subtleties as the absence of Suzdal and Galician churches middle of XII century resonator holes - in the rest of Russia, they were83. This leads researchers to believe that to Yuri Dolgoruky in the late forties-early fifties XII century came the team of Galich. Let's Galytsky version of" detail. Look, what are the arguments in favor of arrival in Suzdal Galician cooperative. First, that the Vladimir Galitsky and Yuri Dolgoruky were allies. Secondly, what and Suzdal, Galicia and temples belong to a cross type. Third, the similarity of construction equipment Suzdal and Galician churches84. The base argument Voronin was white stone assumption Cathedral in Galicia, similar to the churches of Suzdal land plan, masonry, solution and foundations85. For the first time this Church was mentioned in the Chronicles in connection with the death of Yaroslav Osmomysl (son vladimirka Galician) in 1187, and N.N. Voronin referred his erection to 1157, linking it with the Agency this year Galician eparchy. This Cathedral was decorated with sculptures zooantropomorfnogo type86. N.N. Voronin also mentioned the Church of our Saviour in Galicia, built before 115287 and similar to Spaso-Preobrazhensky Cathedral in Pereslavl88. All this has allowed NN Voronin very categorically stated: "All these similarities do not leave doubts that the master came from Galicia"89. But doubts, despite the enormous prestige Voronin, still remain. First, the Dating of the assumption Cathedral in Galicia 1157 year is very rough. Secondly, how could the master of the assumption Cathedral, even if it was built in 1157, go to the jury in 1152? Thirdly, zooantropomorfnogo type in any Church Yuri no - he only appeared in Andrew Bogoliubsky, not before the end of the fifties and early sixties. M. ioannisyan makes clear, as the basic evidence of the impact of Galich and coming out cooperative masters he leads not the Cathedral of the assumption, and the Church of our Saviour, similar to the temple Yuri not only plan, construction technology and decor, but also by sizes (Fig. 5). 8 - the Church of deposition of the robe on the Golden gate in Vladimir. M. ioannisyanom also mentions the Church of St. John in Przemysl, related to 1119-1124 years90, from which only the foundations, technique (but not in the plan and not the size) is similar to the construction of Galich and Suzdal fifties. But just look at the plan of the Church of St. John (Fig. 5)to understand that she could not serve as a model for Dolgoruky, and generally very low probability of its construction in white-engineering - very thin walls and pillars compared with spans of the vaults. Perhaps it was a brick. It is possible (and likely)that it was built of stone, but is covered with wood, like many Western European churches91. From the temple in Zvenigorod Galitsky got nothing left but a similar technique masonry foundations. But we see the plan (Fig. 5), not only totally unlike Dolgoruky, but in question in a temple belonging to the cross type. Two pillars (Fig. 5 dashed), M. ioannisyanom entered in the reconstruction, in order to present the Church as the cross until it finds archaeological evidence - at least in the form of remains of the foundations. M. ioannisyan puts Zvenigorodsky temple in the time between the erection of John in Przemysl, and our Saviour in Galich92 making conclusion about the work on all three buildings of the same building the farm. But this conclusion can hardly be considered quite reasonable: the difference between the plans and the size of the temples too great, with no stable trends we see. In activity of one artel of artists who worked on one of the Prince - vladimirka of Volodarevich, at least, would have to be traced to a single logic. But even leaving aside the controversial Galician buildings (the assumption Cathedral in Galicia, churches in Przemysl and Zvenigorod), based simply on the fact that the Church of our Saviour in Galich built shortly before the temples in Pereslavl and Kideksha (not later 1152) and largely with them similar93anyway about the work in Galicia and Suzdal same building the farm remain serious doubts. After all, we come to yet another contradiction - as one team managed a year to build a temple? In the chronicle under 1152 referred Pereslavl, Kideksha, Yuriev-Polskiy, Church or chapel of our Saviour in Suzdal, the Church of St. George in the yard Dolgoruky in Vladimir94. Even if we accept the version of NN Voronin that in 1152 Dolgoruky built only three temples95, or M. ioannisyan - that only two (it dates St. George's Cathedral in Yuryev-Polish 1148-1151 years96), it is still one of the farm is too much. Besides, she had to finish (or even fully constructed) Church of our Saviour in Galicia. But in the case with a large "stretch" (referring to the Church of the Saviour in Galicia to the mid-forties, and the Cathedral in Pereslavl - closer to 115797) to allow to all construction sites Dolgoruky work the same farm, there will be no less serious doubts. Since then, according to Rappoport, the same gang engaged in the construction and Andrei Bogolyubsky and Vsevolod the Big Nest98. M. ioannisyan, based on the technique of laying the Foundation, believes that the recent building of this group of artists were the Golden gate in Vladimir99. But Omiani, and on PA Rappaport it turns out that this Association worked for about half a century (or 1120-ies by 1160-e in lesser Poland100, Galich and Suzdal, or 1150 x on 1190-e - only in Galicia and Suzdal). So really, if this cooperative lesser or Galician origin for half a century has not appeared any competitors? And is it not strange that the unprecedented active and fruitful work of such "superarteli" found no reflection in the annals? About masters Yuri't say anything at all, but about the masters of Andrey (not all, but more on that later) it is known that they were "of all lands"101, Vsevolod - that he who is not looking masters from the Germans, but used the wizards from the clergy of the Holy virgin and of his"102. And in PA Rappaport turns out that all this time there was only one team. All this is, indeed, very strange, and we have to digress from our main topic, and try to understand: is it so hard to tie our analysis to the work of a building the farm and track the conversions? Let's start with the fact that M. ioannisyan about the same Polish-Galician-Suzdal cooperative makes a reservation, that in Poland this gang, perhaps, was free, and so Prince Volodar (father vladimirka) in 1110-ies I managed to get, in spite of hostile relations with the Polish Prince103. But the question is whether this team was so free not only from the "working relationship" with the Polish Prince, but also from civil obligations in respect of the latter that went to the enemy? Why the Polish government, at least, did not return the masters ago, and as a maximum, not executed them for treason? It is one thing the transition from Prince to Prince icon painter, jeweler or a sculptor with a pair of apprentices (they could pass unnoticed under the guise of a wandering monks), and another thing - the whole building cooperative. It's not three or four people, and much more. Let's at least a rough estimate of how many artists could include cooperative. This calculation was made by p. Rappaport. Referring to page 325 the first volume of labour Voronin, "Architecture of North-Eastern Russia", he wrote that the Church of the Intercession on the Nerl river was built about 30 masons. Adding here the carpenters, roofers, moulders and obzhigalschikov brick (in the case of a brick building) and "administrative and managerial personnel, he received the average size of the farm from 30 to 40 people104. Unfortunately, in this case the reference Rappoport on the classic work Voronin is not entirely justified, because the number of craftsmen who built the Church of the Intercession, there is nothing to say. In Voronin described already used us the calculation of labour input in person-days, and not referring to the whole building, but only to break down and processing of white stone105. Apparently, PA Rappoport, without considering the last divided the total Voronin (7307 person-days) at 200-250 days, got about 30 people and announced their master-masons. But those unaccounted for were masters who laid the walls, vaults and foundations, preparing lime and perform other work listed in our calculation of the overall complexity of the white-stone building (see item 3 of the Annex). As the complexity of these works is 3723 people-DN. Keeping p. A. Rappoport calculations with reference to a book Voronin, "Architecture of North-Eastern Russia", on the basis of two construction seasons, also seems to be not quite correct - the Church of the Intercession was built in one year"106and the construction season, N.N. Voronin, lasted for 168 days107. (7307 + 3723) : 168 = 65 people. Adding here "administrative and managerial personnel and supervisors breaking, processing and transportation of white stone (or moulders and obzhigalschikov brick), we obtain the average number of building the farm from 70 to 80 people. Now let's ask, could the "wandering"108 artel - 70-80 masters with their wives and children (and this is 150-200 persons) - to move huge Tabor from Prince to Prince around the country (or rather, by country), where continuous wars. First of all note that this is not about the Gypsies, and even the merchants, and of highly skilled specialists, who in all times was a great value. "At that time, artists are often captured during various military campaigns, because they were considered quite expensive and valuable commodities (VP Vygolov)109. And as any transit of goods through independent portions rigidly controlled (remember the adage feudal times - "what with who fell, they lost), passing a construction team of any Prince or Governor could stop and get to work on yourself. And in the event of war - even destroy, to prevent the enemy to build temples and fortifications. In the West within a relatively unified "Holy Roman Empire" - wandering the farm lay masons appeared only at the end of XI century and is still their movement was hampered by the large number of internal borders110. And here we see the camp of 200-250 people, which goes between the independent, often hostile to each other principalities, and even the warring States. Therefore, if we talk about schemas collectives provided by N.N. Voronin111 and p. A. Rappoport112 (Fig. 6), it is not so simple, as shown in these diagrams. Fig. 6. Navigation scheme and the work of building collectives (PA Rappaport). For example, the arrival of building the farm vladimirka Galitskogo to Yuri Dolgoruky in the theory was possible - princes were allies. But the fact that this Association was able to pass unnoticed through the chain of hostile Yuri principalities, already unlikely. And if to assume good (or with minimum losses. the arrival of the farm, in Suzdal, it turns out that in 1152 it "multiplied" on several temples, built almost simultaneously (at least in Pereslavl, Kideksha and Yuriev-Polsky). Therefore, it is not one, but several collectives, and then all further scheme looks untenable. We said in paragraph 2 of this Chapter that M. ioannisyan to address the latter problem delays the start of the construction of St. George's Cathedral in Yuryev-Polish for four or five years ago from 1152113. But then we need to move away, respectively, and the inception of the city of Yuriev-Polsky, dezavuiruya message Printing chronicle under 1152 not only the churches, but also in respect of fortresses. Remember this is important evidence chronicler Rostov - contemporary Dolgoruky114: "At the same time, George Duke in Suzdal be, and wtvyrz him God razumniy eyes on the Church building, and many of the Church of postavila on Suzdalskoe the country and placed the Church of stone on the Nerl, the Holy Martyr Boris and Gleb, and the Holy Saviour in Suzdal, and of the Holy St George in Volodimira stone, and Pereaslavl hail transferred from Klemania, and founded a large hail, and the stone Church in it there the Holy Saviour, and do Yu books and mommy wondrous saints, and Gergev founded the castle and the Church there the stone Holy Martyr St George"115. Of course, we follow NN Voronin and M. ioannisyanom can assume that the chronicler just "summarized" Dolgoruky started in 1152 (or even in 1148) and completed in 1157116. But in the beginning of the quoted message chronicler makes sense accent on the date of the buildings: "at the same time (in 1152 - SZ) George Duke in Suzdal be". Indeed, Yuri about three years - from 1149 to 1151 - was in southern Russia and returned to the Suzdal region only at the junction 1151 and 1152,117. Therefore, we find ourselves faced with the choice of one of two mutually contradictory options: message Printing record and the results compiled by N.N. Voronin, p. A. Rappoport and M. ioannisyanom schemes transition collectives. Given the ambiguous move through several warring principalities huge Tabor builders, I propose to stand on the side of Rostov chronicler and to date all listed Dolgoruky 1152, thus negating the possibility of coming to Yuri artel of Galich. Soon we will see that the use of local personnel simultaneous construction of several points, it's quite possible - unless, of course, allowed resources. And in the last two years after Yuri stay in Kiev was hardly afford - not for nothing Kiev treated him as greedy118. On our position regarding the Dating of buildings Yuri 1152 can influence the process and stored in the State Hermitage antimins (confirming the correspondence of the consecration of Archbishop of" Nifont at Prince George in 1148 certain "the altar of St. George"119). Arguments E.E. Golubinsky against membership of corporal Novgorod Bishop Nifont (related to the absence in the middle of the XII century practice of sending corporal)120 we can add that Nifont was Archbishop. Archdiocese of Novgorod was founded only in 1165121and hardly Nifont voluntarily assumed the new title, in gross violation of Church discipline. Of course, there is the theoretical possibility "personal" award Archbishop Nifont dignity Patriarch, but it would be a serious beyond Orthodox Church practices: the Archbishop and Metropolitan of - the title is not personal, and linked (at least nominally) arhipastyrskim in the region where ever was established by the Archbishop or Metropolitan. So, since 1148 there was no decision of the Patriarch on the establishment in the Novgorod Archdiocese, Niphon had no right to be called the Archbishop of Novgorod. 122 cannot be dated earlier 1549, when the Bishop of Novgorod, was canonized. But suppose it had a personal award (or even unauthorized appropriation) Archbishop of title and, indeed, corporal 1148 was sent Nifont. But then we have no right to assume that the corporal belonged to any of the large stone churches: in 1148 Niphon was in Suzdal123and most likely it would be his personal presence at this event as a bookmark Dolgoruky first white-stone Church. And because Nifont only sent corporal, he could talk about one of the many wooden churches dedicated to St. George. For example, on the throne of St. George yard of Yuri Dolgoruky in Vladimir: there certainly was a wooden Church, preceded the stone built, as we have just seen, in 1152. Thus, Dating on the basis of reports Rostov chronicler of all the buildings Yuri 1152, we refuse to release the arrival to Suzdal Galician construction cooperative. Of course, we in no case does not call into question the potential usefulness of developing a navigation scheme masters is one of the possible solutions to the issues of Dating and authorship of the monuments. Moreover, it is impossible not to admit that if the comprehensive approach (taking into account the issues and the policy and economy, and architecture and construction) preparation of schemes collectives has the full right to claim the status of an independent scientific discipline within the history of architecture. But I offer in our study on the possibility to follow "Occam's razor"124 and do not multiply entities beyond necessity". And soon we will see that in the analysis of any period of Vladimir-Suzdal architecture it is possible to do without mapping collectives. Undoubtedly, "single" master of the Prince to Prince crossed often. But, as we have shown, the process of transition of the whole building cooperative was very cumbersome, and in the feudal and actual civil war that could occur as a rare exception, not the rule. Consequently, the collectives could happen only "officially" - between the principalities associated allied relations, pre-arranged "through diplomatic channels", the allocation masters when moving the appropriate protection, with the guarantees of a fair wage and household settle in a new place - because it was not a feudal dependent peasants, but of the free urban artisans. Even within a single Principality transfer of an entire farm from city to city was fraught with domestic difficulties. Urban artisans - not the terrorists involved military discipline. Thus, the organization of transition of the farm demanded great organizational effort and expense of the "sponsor" of the Prince. Hence, we may make a General observation: where the requirements for the timing and quality of construction allowed to use the local people, the princes, as a rule, preferred this option. We emphasize that we are talking primarily about the "ordinary" builders (i.e. the vast majority artel). Architects, painters, jewelers and other unique and highly specialized professionals to go from Prince to Prince and from town to town as often as you wish. Against pre-emptive use in the construction of local personnel may be challenged associated with the fact that after the construction of the building builders like is nothing to do, and all they have to move to a new construction site, even if in a different city or the Principality. But, for example, white-stone building Suzdal land was a break from 1165 to 1185 years - as the master lived without orders for 20 years? On this subject, you can nominate any assumptions, up to the fact that the team that worked Andrei Bogolyubsky, after his death has left for limits of Russia, then in 10 years back and continued the work of Vsevolod. But we are in compliance with the "Occam's razor" can give the most simple and plausible explanation: when the order was not, local craftsmen were engaged in any handicraft (first of all carpenters), and even peasant labour. Moreover, the construction could not be their primary qualification. For example, N.N. Voronin brought a contract for the demolition and construction of new Church of St. George in Vladimir, concluded in 1783 with the peasants of the village Surany125. Another typical example is of a higher social stratum", but closer to the time Dolgoruky: architect (at least, the organizer of construction) VD Yermolin was one of the largest merchants his time126. And when you consider that in the conditions of feudal relations of the XII century builders to work more often complained of is not money, but the earth127 then everything falls into place. Perhaps the architects and highly skilled masters even formed a class a "service landowners" (noblemen128) along with the "near" the Prince's retinue, but "ordinary" builders are unlikely to become the nobility is not the level. Most likely, they were and remained urban artisans or peasants, and work on the construction gave them the opportunity to get own land or increase existing ones. With regard to the qualification of "ordinary" construction, any Russian peasant and nowadays is able to perform construction work on a very wide profile, especially under the guidance of highly skilled craftsmen. And not only the farmer. For example, Kavelmaher came in the late fifties of the twentieth-century restoration the site belokamenschikom no experience of such work, was able independently to hew wrought stones in a month without any "master instructor", just exchanging experience with colleagues129. With regard to the most difficult part of construction - erection of arches and drums - this work was carried out on the wooden wheel and formwork130. Consequently, the main work was a carpenter, and the experience of such work in the ubiquitous wooden building in the XII century was enormous. And the sails (or Tromp) could put one master qualifications - work is fine, but the volume is small. And let's not forget that in every city, in addition to temples and fortifications were built a lot of wooden and often brick constructions of a civil nature131 so a necessity even for the professional Builder to move from city to city, and even of the Principality in the Principality, has arisen not as a rule, and as an exception. Yes, and the invitation of skilled craftsmen was an extraordinary event, and it is usually found reflection in Chronicles (remember masters of all lands" Bogolyubsky and important reservation vsevolodova chronicler of that Big Nest was not looking for "painters from the German"). Especially it covered such events in Europe132. In chapters 3-4 we will be able repeatedly to illustrate the fact that the size and the historical fate of Vladimir-Suzdal and early Moscow white stone churches led the work is local construction personnel. But still remember that in the Chronicles about the masters of Yuri Dolgoruky does not say anything. Hence, we may assume that someone from Galich in Suzdal in the late forties - early fifties XII century, after all, was invited. Let this was not a construction team (as we have seen, its passage through the chain of hostile principalities and "reproduction" in Pereslavl, Kideksha, Vladimir and St. George is doubtful), but the architect and some of the most professional ("elders") masters could go from Galicia to Yuri and in 1152 to organize simultaneous construction of several points, using local personnel, guiding them and even independently performing especially important works. 133. In this case, we can even assume that simultaneously with temples Dolgoruky was still under construction and the Church of our Saviour in Galich - there could well be one of the assistants of the architect (or one of the "older" masters)to oversee the work. And since the plan, the size and equipment construction was determined primarily architect (of course, in accordance with the requirements of the customer - Prince or Bishop), the similarity of the temples Galich and Suzdal seem to find a satisfactory explanation. Such variant is possible also: the unity of the artistic and architectural tastes princes led to the unity of style and technology of construction, which was achieved with a constant exchange of experience between architects and Yuri vladimirka. Therefore, the expression "the coming masters of Galich in Suzdal" without prejudice to our study may be replaced by an "architectural influence of Galich in Suzdal. And this impact could be in the form and the arrival of artists, architects and invitations, and "exchange of experience". In this connection, let's see, could there be an architectural influence of Galich in Suzdal. In theory, of course, could have, but practice proves the opposite. Prince Vladimir Galitsky was as Dolgoruky, a descendant of Yaroslav the Wise, but a generation younger (father vladimirka, Volodar Rostislavich, was the grandson of Yaroslav, and his father George, Vladimir Monomakh, the grandson). In the scope of the Galician land vladimirka Volodarevich was a key figure134but he never claimed to be the Grand Duchy of Kiev, and could not claim - "Prince's ladder135 did not give him any chance. In 1139, the Vladimir Galitsky was still an ally of Izyaslav mstislavovitch136. In 1143 he was in Alliance with the Hungarians went to the battlefield against the combined armies of Slava (elder brother of George), the ol'govichi and his former ally Izyaslav, but managed to make peace137. In 1146 formed a similar situation, only the army against Galic was led by the great Prince Vsevolod ol'govich (fortunately for vladimirka, seriously ill during the siege of Zvenigorod and soon died138. The Union Yuri and vladimirka shape only in 1149, when the latter helped Dolgoruky capture Kiev. But in 1151 vladimirka very unflattering expressed to the Yuri and his eldest son Andrey139 and returned to Galich. In the siege of Kiev, which were in the same year Dolgoruky and the ol'govichi, he was not involved. Then he went to the help of its allies, but to learn about their defeat in Kiev, returned back140. In 1152 his land looted Hungarians141. On this and ran short, and not very close Alliance Dolgoruky and vladimirka - the more they did not fight together. Vladimirka Volodarevich died in 1153, and in Galicia began his reign of his son Yaroslav Osmomysl. In the same year the army last defeated Izyaslav Mstislavich, but soon went to Kiev142. After the death of Dolgoruky Osmomysl in 1158 participated in the capture of Kiev and inviting reign Rostislav of Smolensk, and then he disappeared from the Russian political scene, and "quiet" rules in Galicia until his death in 1187144. After that, under the blows of the Hungarians began to fall in Galicia, which in the beginning of the XIII century is, in the words nm Karamzin, "shame disorder"145. And by 1387 Galician-Volyn land were fully occupied Poland146. Now you might ask: could the Vladimir, one of the princes, so to affect Dolgoruky, candidate for the Kyiv table, and even more on his successor, Grand Duke Andrei, Vsevolod and many others, - that during the past three hundred years old building in the North-Eastern Russia were only conducted in Galician, an order of magnitude more expensive technique? Of course not. Moreover, at the junction of the forties and fifties, except vladimirka Galitsky, a Dolgoruky was ally, standing on the top "of the Prince's ladder" - Svyatoslav Olgovich Chernigov147. Yuri vassals during the struggle for Kiev were Ryazan and Murom princes148. So why in the Suzdal not affected, for example, Chernihiv - the second city in Russia after Kiev? Or, at least, Ryazan and Murom? And if, as written Voronin149 and O.M. ioannisian150 at Dolgoruky was not their masters, and he was forced to be content with a team of Galich, then surely it could not take masters from Kiev, where the actual rules in 1149-1151 years? And if he for some reason is not found (or not managed to find) artists in Kiev, surely he could not invite masters (at least, architect) not from the vladimirka, and from the ol'govichi and to use cheaper and technological brick technique? And finally, if the jury for some reasons unknown to us, he was forced to be content with a team of Galich, who owned only white stone technique, then why does he or his descendants at the first opportunity not passed onto a brick, and continued building of white stone, three hundred years? N.N. Voronin as an argument in favor of influence Galich led Galician city names, founded by Yuri Dolgoruky - Zvenigorod, Przemysl, Gorodets and Mikulin151. But even if the version on the basis of these cities Yuri be considered confirmed (doubted himself N. Voronin), it is still Dolgoruky gave Galician the names of small fortresses and cities with the stone building he called Pereslavl and Yuriev (the latter, most likely, not after himself, and in honor of a small but meaningful southern Russian city, which had their Bishop152). Even the river they were named in Pereslavl and in Kiev-Trubezh and Lybid. 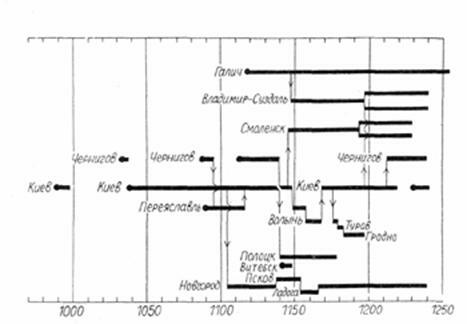 Mass reproduction of Suzdal "indigenous" Russian names was a logical consequence started Yuri and completed by Vsevolod process of transferring the great Prince on the North-East, and this tradition began in Monomakh (Volyn Vladimir Vladimir Zalessky) and in pre-Mongol times is not interrupted. For example, the chroniclers emphasized that Andrey Bogolyubovo was built at the same distance from Vladimir, as Vyshgorod near Kiev153. And Yuri Vsevolodovich founded Nizhny Novgorod and, most characteristically, Galich Merskiy (Kostroma)154. In the beginning of XIII century "radical" Galich just was a "shame disorder", and talk about his influence on his grandson Dolgoruky, of course, is not necessary. And similarly, we cannot talk about any significant impact of Galich and during the reign of Yuri Dolgoruky, and during the reign of Andrei Bogolyubsky. The possibility of voluntary action on the part of the latter (for example, a particularly close personal friendship and Yuri vladimirka or Osmomysl and Andrew) we considered in paragraph 8 1 main and saw that this explanation cannot be considered satisfactory. Therefore, we are forced to abandon the version of the architectural influence of Galich in Suzdal. One might say the opposite effect - Suzdal in Galich, and this version, except for seniority Suzdal princes, is another confirmation: stone construction in the Galician land was much cheaper than in Suzdal. The white-stone Galician architecture, strictly speaking, be called correctly. Galicians built from different kinds of local limestone, alabaster, Sandstone, travertine155. Geology of the Galician land is fundamentally different from Suzdal. Galich is located near the Carpathians, on the hill, cut by deep ravines along the bed of the Dniester. On the geological map, shown in Fig. 4, near the Dniester visible deposits Silurian period - Transnistrian stone even better than myachkovsky related to a late Carboniferous period. And in any case, the Galicians were not able to carry construction materials for 500 km - all Galicia fit into the rectangle 350 150 km (excluding Volhynia, but the city of Galich and Volyn joined only Roman the great, who reigned there in 1199-1205 years). So, the stone construction was given Galicians much easier than suzdalians, and they could lead him under the influence of Yuri Dolgoruky or, for example, Poland (on Omiani156). Therefore, we are unable to accept a compromise version of the parallel construction of the beginning of the fifties of the XII century in Suzdal and Galich, with the caveat that the influence of George on vladimirka likely, but the opposite is not. The Chapter 3, we see that they could build and independently, exchanging experience" - the Vladimir under the influence of neighboring Poland and Dolgorukiy - the state, whose authority for a candidate for the Kyiv table and his descendants - the Grand Dukes of Vladimir - was more significant. It should be noted that such "authoritative state" were not Volga Bulgaria, and not one of the countries of the Caucasus, though in fact, in both cases there are arguments "for". About influence of the Volga (Kama) Bulgaria said E.E. Golubinsky, citing, in turn, on the Stroganov. Arguments similar to "Galitskie": stone, masonry and mortar157. And the logic of this argument is typical of the Church historian of the late XIX century: according to the tenet of "Orthodoxy, nationality, autocracy" was less "offensive" to recognize the influence of Muslims and pagans than Catholics and Protestants. But Voronin in "the History of Russian art"158 wrote: "the Bulgarian theory" is based on a completely false data on Privoz for Andrew construction of white stone from the Volga Bulgaria, the reason and the hypothesis about coming out and architects". And in "the Architecture of North-Eastern Russia"159 he leads the arguments Palace in Suvar (X-XI century) was built of brick and white stone buildings appeared only in the XIV century in the ancient city of Great Bulgaria. And the technology stack there was quite different. Probably the influence of the Bulgarians cannot be denied. In 1152, using lesions Dolgoruky in the South of Russia, they attacked the Suzdal land and besieged the city of Yaroslavl. Perhaps fortress Kideksha, St. George, Pereslavl, Zvenigorod, Dmitrov, Moscow Yuri began to build it under the threat of further promotion of the Bulgarians160. So to speak about full absence of influence of the Volga Bulgaria for Dolgoruky hardly fair, but this influence is expressed not in the white-stone construction, and in its contribution to the state of "eternal war", in which he remained Dolgoruky (and all Rus ' at that time). In turn, the "eternal war" indirectly influenced the appearance and the historical fate of buildings Dolgoruky, and we will talk about it in the main 4. Now let's consider another version of the direct influence of the white-stone building Yuri - "Caucasus". We are talking about the version of F. hull, which V.N. Lazarev quite abruptly called "fantastic"161: Yuri Dolgoruky been influenced by the countries of Transcaucasia. "For" - stone (but not white), cross circuit, sculptures and heavy drums Caucasian churches. Much in common with buildings Dolgorukiy and his descendants have Jvari monastery (VI-VII century), Echmiadzin (VII century), Svetitskhoveli in Mtskheta and the Church of Bagrat in Kutaisi (XI century). But there are cons: the remoteness and the lack of a permanent and sustainable political ties Suzdal land (and the whole of Russia) from Transcaucasia. In Soviet times, have developed a stereotype that Georgia and Armenia are almost our neighbors. But in fact, in the XII century the Caucasus was much more far not only in comparison with the times of the USSR, but also with the times of Vladimir Svyatoslavich and Yaroslav the Wise: on the Volga river and the Kuban settled "wild" Polovtsy. At the end of XI century from the map disappeared Tmutarakan162. Monomah "tamed" (and provisionally) only the Western camp163and Russia has been separated from the Caucasus "field", impassable even for merchants - "wild" Polovtsy were not bound by any ethical standards164. Of course, remained waterways, and occasional contacts have taken place (for example, the second wife of Izyaslav Mstyslavych was Georgian Princess), but about the Caucasus in the Russian Chronicles says rarely, and in times Dolgoruky relations Suzdal land, with the Caucasus countries was much more distant than with the Principality of Galich. We came to the conclusion that, as in the case of Galicia, in theory, the influence of the Transcaucasian architecture of Suzdal could take place. But the analysis of political and economic practice shows that force Dolgoruky to build temples for ten times higher "estimate" Transcaucasian experience could not less likely than Galitsky. The maximum that could be - it records that experience builders Yuri, adjusted for Suzdal climatic conditions and soils. But the fact of the beginning of the white-stone building Dolgoruky and the continued use of white stone, his descendants did not affect the Caucasus, Bulgaria and Galich. Probably, it is already possible to stop an enumeration of the regions of Russia and a small adjacent countries - no region, no small country could not induce the princes of the North-Eastern Russia to go on building of white stone and lead him three hundred years. The only States where the Grand princes Vladimir, and then Moscow could watch the "bottom up", there were two empires: the Byzantine and Holy Roman". But in Byzantium were built of brick or technology "opus mixtum", that is to influence the choice of Dolgoruky white-technology Byzantine experience could not. So, we can only influence of the "Holy Roman Empire". The experience of the past we can call the European: the stone temple was Romanesque architecture not only Empire (Germany and Italy), but also neighboring France, England and Spain.